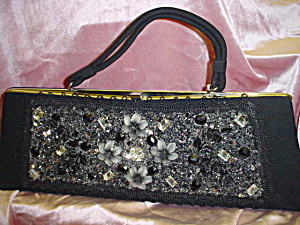 This circa 1960's black original, Caron of Houston Texas, purse is packed with silver sequins, clear rhinestones, lucite black roses and beads. The flash of the camera shows yellow but in truth, the front is clear chrystal, silver and black. A clean stunning purse to take pride in. You will treasure this one forever. Measures about 6 inches by 17 inches.